Pittsburgh, PA (October 1st, 2018) – A home is the most significant investment many people will make during their lifetimes, and safeguarding an investment of that magnitude is vital. An HSA Home Warranty protects both buyers and sellers from unexpected failures, covering the cost to repair or replace items that break down due to normal wear and tear. Those who attend open houses the weekend of October 6-7 can register to win one of twelve (12) HSA Home Warranties, good for one year of coverage. Howard Hanna agents hosting open houses will be able to explain in detail all of the benefits that come along with an HSA Home Warranty. For more information and to view a list of open houses near you, visit HowardHanna.com/HSAWeek. 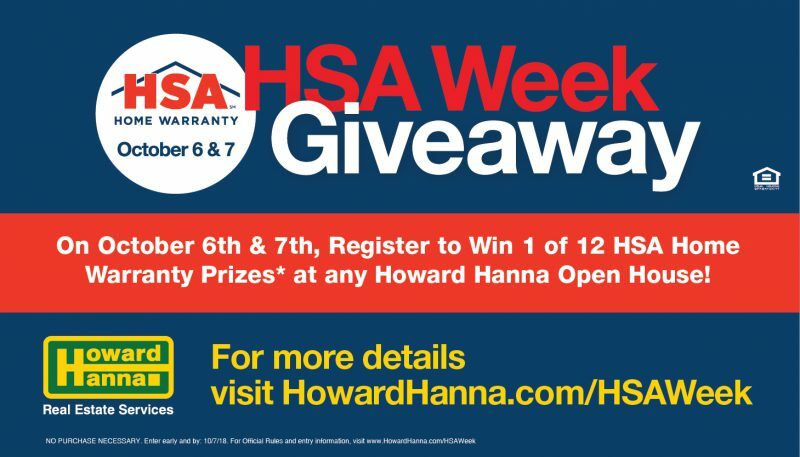 Entrants must complete a “register to win” entry form at an eligible Howard Hanna open house during the HSA Giveaway Weekend: October 6-7, 2018. One entry per person, per open house. Contest not available in New York. 12 total winners will be selected by random drawing from all entries to win one of 12 HSA Home Warranties through Howard Hanna Insurance Services valued at $475.00 (PA/OH/WV), $460.00 (MI) and $480.00 (VA/NC) each. The number of winners varies per market: Ohio (4), Pittsburgh (3), West Virginia (1), Erie (1), Harrisburg (1), VA/NC (1) & MI (1). Limit: One (1) prize per person. All completed entry forms must be received by Howard Hanna Real Estate Services at each particular open house before the conclusion of the scheduled event on October 7, 2018. Winners will be determined by random drawing to be conducted on or about October 12, 2018, and winning names will be posted on the Howard Hanna Real Estate Services Facebook page. Howard Hanna Real Estate Services will conduct the drawing and its decision is final. All federal, state and local laws and regulations apply. Void where prohibited by law. HSA Home Warranty has been providing quality home warranty products and providing first-class service since 1984. For more information, visit OnlineHSA.com. Howard Hanna Real Estate Services is the 3rd largest real estate company in America, the #1 privately owned broker in the nation, and the largest home seller in Ohio, Pennsylvania and New York. The family-owned and operated real estate company specializes in residential and commercial brokerage service, mortgages, closing and title insurance, land development, appraisal services, insurance services, corporate relocation and property management. With 279 offices across OH, PA, NY, VA, MI, WV, NC and MD, our more than 9,200 sales associates and staff are guided by a spirit of integrity in all aspects of the real estate process. For more information, please visit HowardHanna.com or Facebook.com/HowardHanna.